The first reaction by the reader of this article would be to question the title itself. Is distracted driving a bacteria that we need an antibiotic to kill? My answer is YES, and I have supporters. In 2009, the former Secretary of Transportation, Ray LaHood called distracted driving by another medical term, epidemic. I do not know why the Secretary chose that word, but surely I can justify my own use of the word bacteria. If not checked in time, bacteria can go out of control resulting in serious and sometimes life-threatening illnesses. Distracted driving is quite similar. If left unchecked it can also get out of hand and cause a crash. My daughter, Shreya was killed when a distracted driver lost control of the car and crashed on the front passenger side where Shreya was sitting. 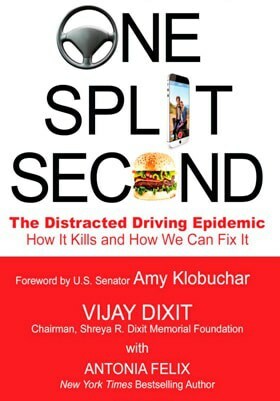 Had the driver taken an awareness-antibiotic-pill for the distraction bacteria, Shreya would still be alive today. Let us dig deeper into the distracted driving problem that has invaded our roadways. And, it is not a recent phenomenon. Only the strain of bacteria has changed. I don’t want to traverse back too far in time. For instance, in the sixties and seventies it was speeding and drunk driving that caused driver distraction. In the eighties, it was the entertainment systems in the cars to make long drives manageable with popular music, talk shows and other types of entertainment. Then the nineties saw sophisticated communication technologies stepping into the cars that went far beyond entertainment. Cars became mini-offices for the working communities and playgrounds for the younger generations. Now in the past decade and continuing into the current decade office and playground have merged. The multitude of distractions attacking drivers remind me of the ancient world literature that is filled with descriptions of mythological dragons capable of transforming from one shape to another with total ease. Yes, I am being dramatic here. It is true that radio news in the cars is benign. But isn’t it also true that the driver distractions have started to behave like those dragons who keep transforming and switching back and forth into texting, calling, Snapchat-ing, Facebook-ing, Skype-ing, Websurfing, Netflix-ing, Pokimon-ing, and the list seems to grow by leaps and bounds every year. Let us move away from these stories and look at both national and state crash data. According to National Safety Council estimates, in the early 2000s we saw approximately 43,000 yearly traffic fatalities in the nation. With good laws, enforcement and education the numbers started to turn downward into the mid-30,000s through 2008 and were flat for about four years. Sadly, since then there has been a significant rise in fatalities, and in 2015 we were back to mid- 40,000s. Jury is still out as to what is responsible for this upsurge. But there is sufficient data available collected by safety experts and universities that points to a conservative 25% of the fatalities caused by distracted driving. Either we eradicate the source of distraction or manage the behavior that causes distractions. I am not willing to blame technology for the ills of our behavior that causes distractions. We are fully capable of controlling our urges, but only if we are desirous, motivated and committed. At the Shreya R. Dixit Memorial Foundation, we strive to inculcate responsible distraction-free driving among all ages. Although these initiatives focus on youth, the message is universal. Our distraction-free driving clubs at four local schools are thriving as demonstrated by their active participation in KARE11’s Eyes ON Campaign to promote distraction-free driving. The Foundation’s clubs at Benilde St. Margaret School and Eden Prairie High Schools were featured in a live TV special on KARE11. An interview with the Eden Prairie club leader Suvarna Nallamalli was the topic of a blog by the Minnesota Department of Public Safety. Both the clubs again participated in a friendly social media competition on promoting distraction-free driving for KARE11’s Eyes ON Campaign. Congratulations to Benilde St. Margaret School for winning the contest. The Foundation invites other area schools to join the existing clubs or establish their own. As I mentioned last time it is only with joint effort that we can make a difference. Let us grow this village and protect drivers from the epidemic of distracted driving. One of our signature events is the annual Raksha-Protection Vigil and 5K-Run/Walk for Distraction-free Driving. We hold it on the first Saturday in August by engaging new and returning student drivers as close as possible to the start of the new school year. This year’s August 5 Raksha event will mark the 10Anniversary. The board of the Foundation invites all to register for the event and support the noble cause of distraction-free driving. Please visit the Foundation website at www.shreyadixit.org for event details and to register. If you are a member of a Running Club or school track team, this will be a good opportunity to help improve your timing. Of course, you will be helping a good cause. Please write to me at vijay@shreyadixit.org. shreyadixit.org. I will wait to hear from you.